Most of the furniture at Rust & Root is custom made to order. General turnaround time is two to three months, but please call Danny at (808) 346-0366 for accurate scheduling and pricing. We work as quickly as we can! Below, you'll find a gallery of past "surfaces," which include dining tables, countertops, bar tops and shelving. Measuring ~45"x78", this table is perfect for six people! It is made of two boards from the same log, glued together in a mirror image called a "bookmatch." These slabs had a strange cutout on one of their ends. In order to keep the width as wide as possible, we added an abstract sequence of wedges, which also adds to the overall texture of the piece. Another interesting bit of texture was added to this corner. The tree had a limb trimmed during its life, which is evidenced by the scarring in the sapwood around this corner. We carved the scarred area to both match and contrast the surrounding texture. Check out the rays of curl! This monkeypod tree lived in Manoa Valley. It has an incredibly rich range of colors for monkeypod. Table base matches the bench legs perfectly. Ebonized oak stretchers for strength and contrast. A little detail of the figure in this incredible slab. Monkeypod dining table staged with chairs. This slab has a rare amount of crotch figure, as you can see in the foreground of this photo. This figure occurs when weight of the limbs stresses the trunk, and the area that the limbs branch out in a Y shape is called the crotch. Crotch figure is common in monkeypod, but this large of an area is rare! Oak conference table. 10'x50", with plenty seating for ten people. Ebony stained edge accents add definition and contrast to the table top. Classic beam stretcher design on the base. 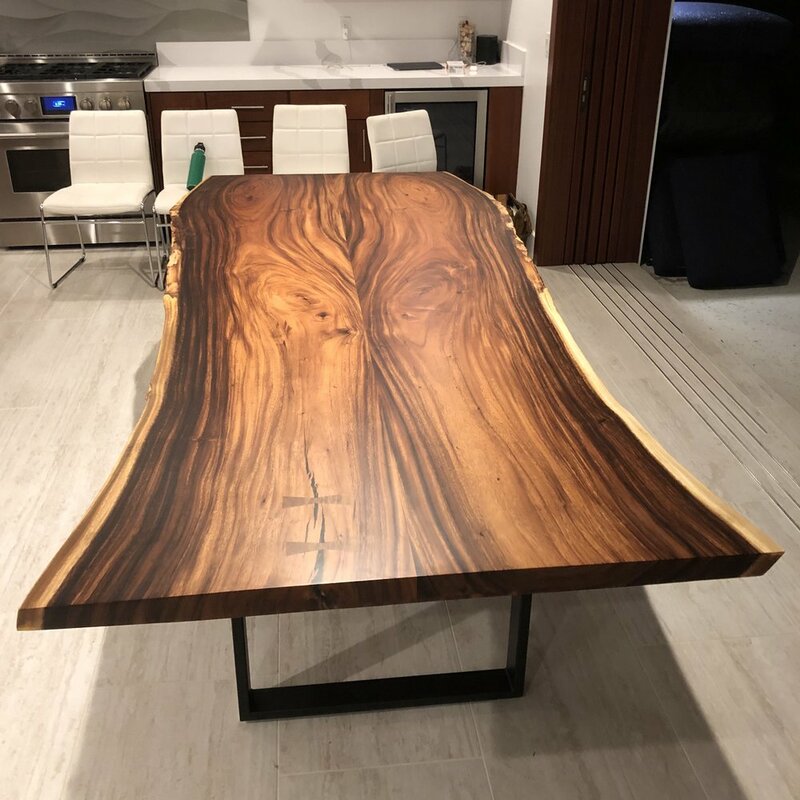 Monkeypod dining table slab. This piece is over 9' long at the longest! True kamani slab. 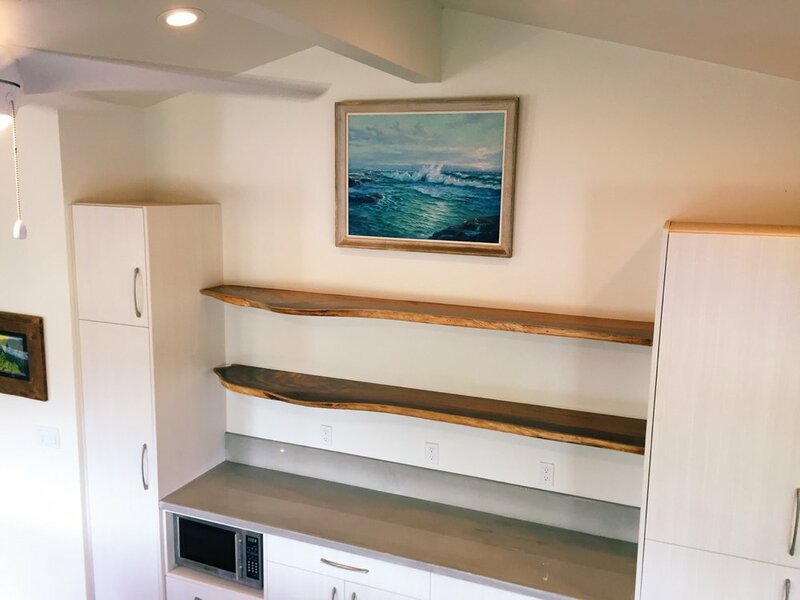 This slab was sawn by Waimanalo Wood, 100% local kamani. George Nakashima - inspired base. This base is made of pommele, and features traditional joinery. No screws were used! Whitewashed oak kitchen table top. Matching dining table and bench set. The tabletop and benchtop are created from the same log, and the walnut base design is carried over from the dining table to the bench. They fit together perfectly! Monkeypod slab creating a little extra kitchen counter space. Live edge mango bar top. Custom mango wine cooler top. Koa kitchen table. 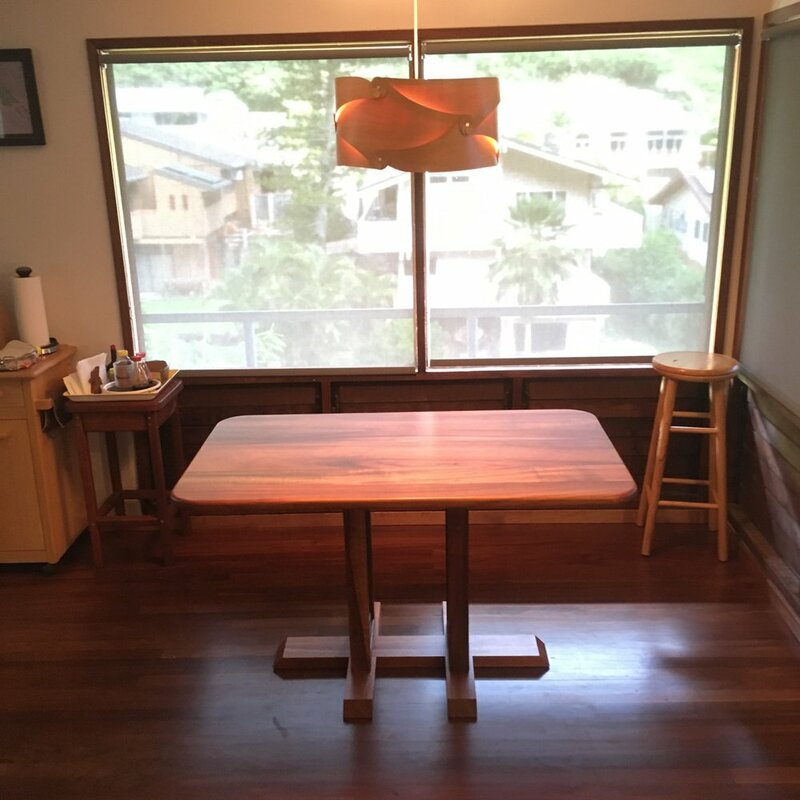 This table was built using koa reclaimed from other parts of the house after a renovation. 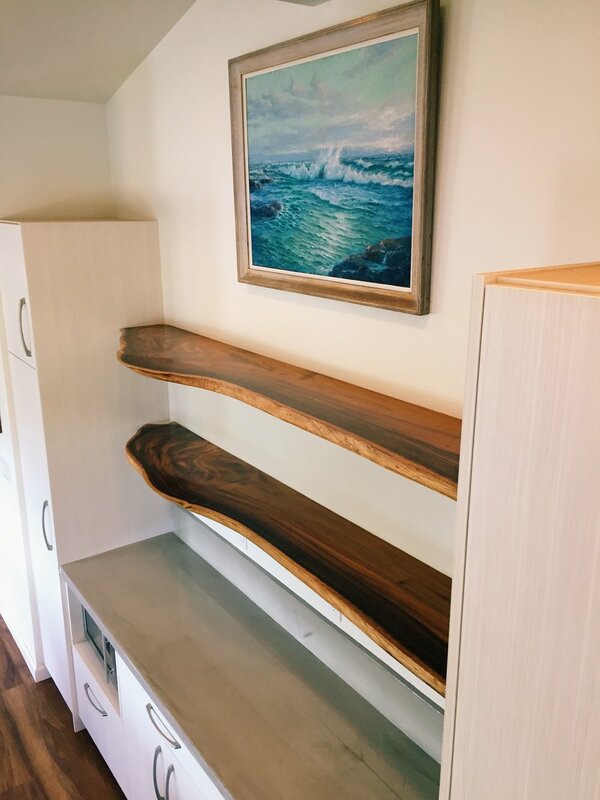 This monkeypod bookmatch was custom made to fit on top of these cabinets. Not a bad place to take off your shoes! The figure in these slabs is incredible.